masonry of this type is now more commonly referred to the Normaan style. But we have here also a relic of an earlier date in the fine shaft of a stone cross, of which more will be said later. Returning to the fabric of the church, we find late Norman or Transitional work in the south doorway. It has no doubt stood in the south wall of the nave, before the side-aisles were added, and then, as was so constantly the case, been re-set in the wall of the new side-aisle. In 1895 it was again moved, being placed one bay further west. Opposite to this door, in the wall of the north aisle, is a small fragment of work of the same period. The south doorway has a cross cut on its eastern jamb, supposed to be a consecration cross. The side aisles were added in the 13th century, and retain their original width. The north doorway is also of this date. The hatching on the outer jambs of this doorway and of a small window in the north aisle shews that the wall was originally plastered over. The arches were, at all events on the north side, broken through the earlier wall, without taking it down. The two easternmost bays on the south side are, I think, the oldest part of the arcades. Both in design and execution they are remarkably fine. The lancet window at the east end of this aisle is no doubt of the same date. Note the curious way in which an epitaph has been cut on a stone forming part of one of its outer jambs, dated 1680. Next in time after these two arches we have the north arcade, and I am disposed to think that the two westernmost bays on the south are of about the same date, and that the nave was lengthened one bay westwards at the time when the north arcade was built. The single billet ornament in the south-west respond is curious. The chancel arch is also of the 13th century, and one lancet window of the chancel of this date remains, but I believe it has been re-set when the chancel was re-built, and probably lengthened, in the 14th century, as the masonry seems all of that date. 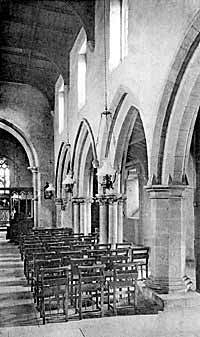 In 1895 the chancel arch was raised, by lengthening the jambs. Rolleston Church. Interior looking East. 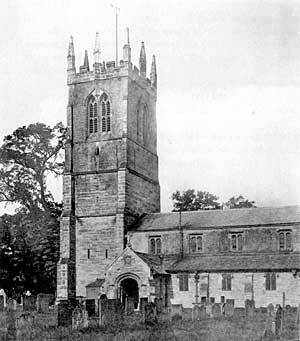 At the very beginning of the 14th century the tower was built. It was broad and low, of two stories only, with thick walls of rubble. All its belfry windows remain in the walls, blocked up, and when the tower was restored, the one in the western face was re-opened so as to be seen outside. In the bottom story are three curious little single-light windows. Of about the same date are the small circular windows in the west end of each of the side-aisles,—a somewhat peculiar feature. Later in the 14th century the chancel was re-built, with square-headed two-light windows in the sides, and a pointed four-light window in the east end. It is to be observed that the square-headed window on the north side is, both in design and execution, immensely superior to those on the south. It is, indeed, an exquisite piece of work. In the fifteenth century two additional storeys were added to the tower,—regardless of the fact that its old rubble walls were never intended to carry any such weight. The builders, it is true, also added buttresses, but these afforded insufficient compensation, and the result was that the whole tower, about thirty-five years ago, was seen to be in imminent danger of collapse. It was shored up with timber as a temporary expedient, and, some ten years later, was made secure by strengthening the foundations of the buttresses, and casing the rubble walls of the older portion of the tower with solid ashlar work. The new belfry storey was admirably designed. It is, I think, the finest example of a type which may be seen at South Muskham, Elvaston in Derbyshire, Beckingham in Lincolnshire, and many other churches in this part of England. The peculiar feature is, that a pair of belfry windows, on each face of the tower, are embraced under a wide ogee hood, which here, as at Beckingham and Elvaston, leads up to an intermediate pinnacle in the centre of the battlements. But while, at Beckingham and elsewhere, this intermediate pinnacle is smaller than those at the corners of the tower, all eight pinnacles at Rolleston are of equal height.